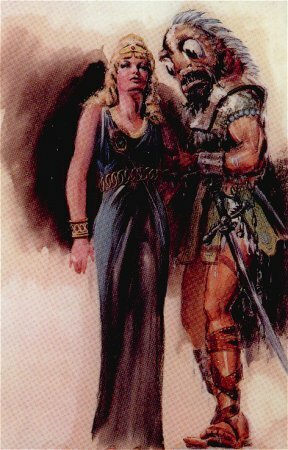 This is the second and final book illustrated by John Coleman Burroughs for his father’s Venus series. John had a fine sense of creating otherworldly creatures based upon the descriptions given in the text. Dust Jacket The cover of the first edition is in color, while the Canaveral reprint edition is the same picture in blue/black and white. I assume that the 5 interior illustrations are black and white reproductions of much more colorful watercolor paintings. 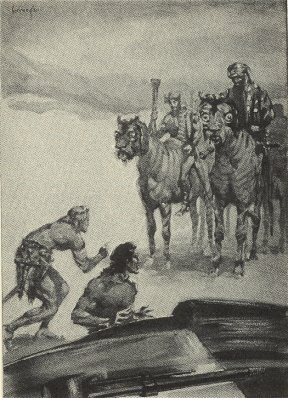 The painting chosen for the dust jacket is rather unique because it is not the usual full color spread but a smaller picture set upon a white background. Here a statuesque Princess Duare is being guarded by one of the Myposan fish-men, whom ERB described as “most peculiar.” “Their full black beards and their gills I have already mentioned; these, with their protruding lips and pop eyes, resulted in a facial pulchritude of something less than zero” (33). We may imagine this scene is taken from chapter seven in the slave market where “The fellow who had touched Duare’s shoulder moved forward to the platform, and the others crowded about him” (52). The fish-man does look very much like a fish, a human with a fish’s head since ERB has told us that the Myposans “had beautiful physiques -- smooth-flowing muscles and not an ounce of unnecessary fat” (32-33). He dressed like an ancient Egyptian or Roman soldier, which suits ERB’s penchant for employing these eras as templates for his romantic adventures. The wrapped leather and foot gear is of this type as well as the short skirt, cuffs, and leather jerkin. The metallic breastplate is short and blends nicely with the fin on the back of his head, which gives the appearance of a grotesque helmet, almost like a statue of one of the Egyptian gods. The long, curved sword at his side is Arabic in style. Altogether, this is a very economical dust jacket illustration, which is very powerful with the fancy script of the title at the top and the heavy block lettering of the author’s name at the bottom. Duare is regal in appearance with her long, flowing gown that reveals her slender figure, brushed in with the same quick strokes as the subtle background wash. I think it is the best illustration in this series. 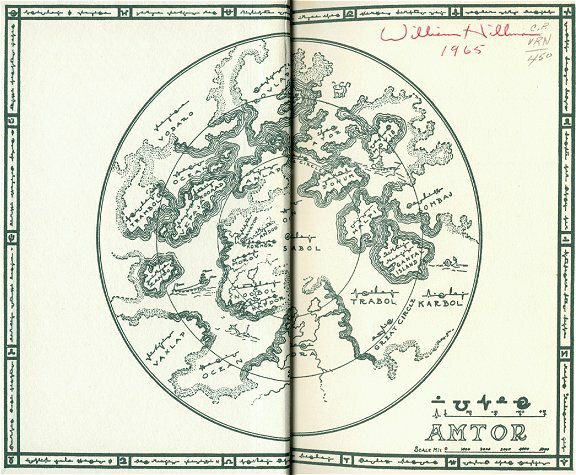 Cover interior and facing page: ERB’s map of Amtor found in both front and back. “The tharban might be described as the Amtorian lion, although it does not bear much resemblance to Felis leo except that it is a ferocious carnivore. It is much larger; its tawny coat is striped lengthwise with dark brown markings; its enormous jaws, splitting half the length of its head, are armed with sixteen or eighteen large fangs and its feet are equipped with three heavily taloned toes; it has a black mane, much like that of a horse, long, pointed ears, and the tail of a lion. It also has a most abominable disposition and an insatiable appetite” (242). 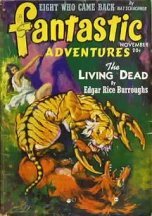 The tongzan is “a creature as large and as terrible as the tharban.” ERB describes it thusly: “Its body closely resembled that of a Bengal tiger; in the center of its forehead was a single eye on a short antenna; from the shoulders, just anterior to the forelegs, grew two enormous chelae; and its jaws were as terribly armed as those of the tharban” (243). 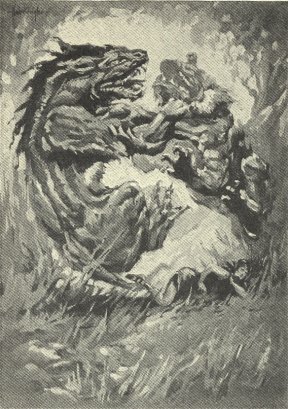 In a circular composition, a tharban and a tongzan fight over the tiny, fallen Duare. JCB has followed his father’s description of the beasts with precision. One wishes that this illustration had been presented in color to give greater force to his original conception. One might compare this illustration with those of Eric Howley in David Day’s “The Burroughs Bestiary,” whose tharban has a more flattened face like a mountain lion, and whose tongzan’s crab-like pincers are much better delineated. Frank Frazetta gives us a nice rendition of a colored tharban with its red and white stripes on the Ace edition of “Lost on Venus,” and another nice colored version of the beast is on “The Wizard of Venus” illustrated by Richard Hescox in the newer Del Rey edition. Joe Jusko also painted a nice, stylish tongzan with a red mane for his card #94 and card #105, which shows J. Allen St. John’s eerie version on the flip side. 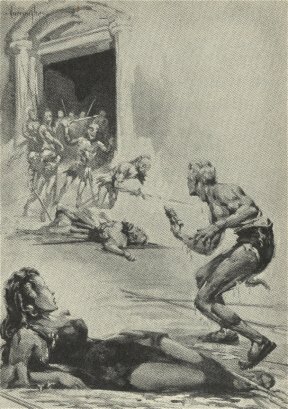 A full-bodied Duare lies in the foreground while Carson threatens a host of Myposan warriors with his pistol, who are pouring through a large, classically arched doorway. Many tridents already lie at his feet. The shading is so subtle that the effect is partially lost in the black and white version. The foreground figures of Duare and Carson are well defined while the Myposans come out of a blurred distance. Among the Brokols, Carson finds that their children were born from trees like fruit, attached by stems attached to the tops of their heads. This knob was retained by adult Brokols. 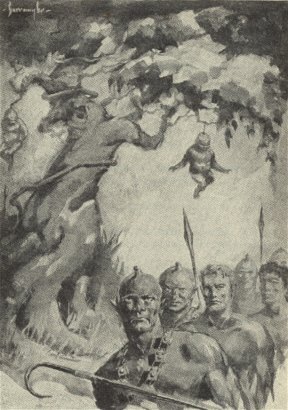 JCB pictures Carson and his friend, Jonda being lead by a group of warriors past a large tree upon which two babies are “nearly ripe.” The warriors of Brokol are “of a sickly greenish hue and entirely hairless -- no hair on their heads, no whiskers, no eyebrows, no eyelashes” (149). long-handled hooks, which they used to pull an enemy close to their swords. In this seemingly grim scene a Vooyorgan is simply reproducing. “You see, these creatures are amoebic neuters; and their dividing is the physiological phenomenon of reproduction . . . they divide into two parts, like the amoeba and other of the Rhizopada” (206). A guard looks down upon the dividing Dan-voo-med, looking rather pleased at his accomplishment. 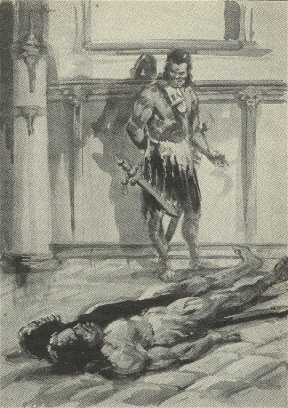 He wears a short, Roman sword at his waist and a longer, barbarian sword on a thick, leather shoulder strap and the typical, single, South Sea islander’s skirt. strange-looking horses with short heads and large, saucer-like eyes. These zorats also have pendulous ears like large cocker spaniels. They have just startled Carson and Ero Shan, who were about to board their space vehicle in the foreground. Since zorats are not the large, dramatic Burroughsian cats or other terrible beasts of his menagerie of strange creatures they probably have not been rendered by artists very much. On a final note about these pictures for “Escape on Venus” I must remark upon the strangeness of the topics. Of course, Amtor is a strange world, and JCB did a great job of picturing the oddities there, however, it seems unfortunate to me that he did not find a way to create at least one picture of classical repose in this grouping, perhaps with Carson and Duare. I suppose that book illustrators need to be specific, and JCB does follow his father’s descriptions to the letter, yet at times I wish that he might have found a way to make a few of his paintings for this book more universal in appeal. I get the feeling that he was filling an order here rather than really being inspired by the topic of a man and a maid on a lush, tropical planet. I don’t mean to belittle JCB’s accomplishments here at all. 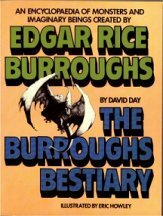 He is a great illustrator of ERB’s creatures, which may be argued to be his strong point as a Burroughs artist. I would just like to have seen that one great romantic picture of the two lovers which would have put the icing on the cake.